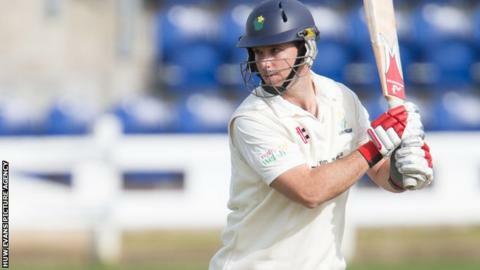 Jim Allenby is an injury doubt for Glamorgan's first home County Championship game on Sunday, against Gloucestershire at the Swalec Stadium. The all-rounder, 31, is having treatment on an ankle injury. Team-mate Michael Hogan said: "I don't know what exactly happened but I have been assured it's not very serious. He tweaked his ankle... playing golf. "So he has been told to stay off it so that he is right for Sunday. It is just a tweak, nothing serious." Glamorgan will be hoping to build on their 10-wicket victory against Surrey at The Kia Oval and will be looking to make it two wins out of two in the County Championship. It was only the Welsh county's third victory in 24 visits to The Oval. Australia-born Allenby, who is qualified to play for England having moved to the United Kingdom 13 years ago, has emerged as a key player for Glamorgan since he joined in 2009. Allenby topped Glamorgan's batting averages in both the County Championship and the Twenty20 competition in 2013. Seamer Hogan claimed his 100th wicket for the season when Glamorgan beat Gloucestershire by eight wickets at Cardiff in 2013. Allenby produced a match-winning performance with both bat and ball as the all-rounder made 85 in Glamorgan's first innings, before completing a match return of 7-47. The win in September 2013 meant that Glamorgan have recorded four successive victories on Welsh soil against the West Country side. Hogan admits Allenby would be a big miss for Glamorgan if he were ruled out by injury. "What did he get last year, 40 wickets and over 1,000 runs in the Championship? So he is a big player for us in the middle order. It will be massive if he is unavailable."